This is the continuation of my series on using deloads/tapers/intro cycles in your training. The initial blog was the reason why we deload. Hence the title, “Why do we deload.” In it I outlined the fitness fatigue model and the physiological reasons why you can’t always train at your true, full capabilities. The predecessor to this entry was “How do we deload? Part 1 of 2.” In that blog, if you did not find a sample deload that fit your context of training, I have good news. 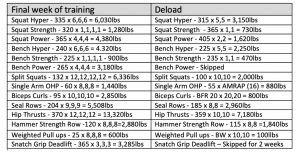 In this blog, I give you 7 more “plug and play” deloads that perhaps will fit your particular needs. Once upon a time I was an RKC (Russian Kettlebell Challenge), certified 3 times from the years of 2008 – 2012. During my tenure as an RKC, I was a big fan of Pavel Tsatsouline’s books and one of my favorites was “Power to the People Professional.” In this book I encountered a truly evil program you’ve probably heard of by the name of “Smolov.” Sergey Smolov is a Russian Master of Sports that coached many of the Olympic Lifting Teams during Russia’s dominance in the 70’s. 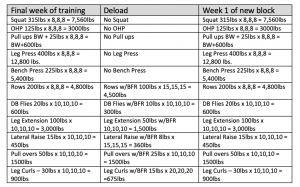 The Smolov Base Phase Squat Program is a 4 times per week program that has been touted to “increase your squat by 100lbs.” Who wouldn’t want to try it right? Needless to say this program was way too advanced for me at the time, I tried to run it in 2009 and couldn’t finish, and I’m not kidding when I say it nearly crippled me. During my second certification as an RKC in 2010, I got the opportunity to talk programming with Pavel himself, particularly about the Smolov Squat Program. Keeping in mind that I did not know of the principles of fitness and fatigue nor the necessity for deloads at this time, Pavel simply told me in his thick Russian accent, “streytch out few veeks of training to last 10 or 12 dayz.” So, I did just that in 2011 when I ran the program again, and wouldn’t you know it, I completed the 12 week program. Albeit it took me 15 weeks, but when you are a tight wad like me, that’s just getting your money’s worth! Stretching out frequency for a few weeks when you are training a bodypart twice, or even three times a week, is another way of dropping volume. If you squat three times per week (or what we might call a microcycle), by simply taking the microcycle and stretching it out over the course of 2 weeks, you now are averaging a squat session 1.5x per week or dropping volume roughly 50% during that time period. With this individual it is unrealistic that they can “train” with greater than 85 – 90% 1rm for more than a few weeks. This often occurs in powerlifters who are very strong, or older lifters who are very strong for their age (and unfortunately their bodies’). When they do visit the heavy loads, it will need to be done with an accompanying drop in volume, so their fatigue does not mask strength. Often times this is the culprit of “feeling weaker” when using loads that you know you can use. With this individual, the deload will need to be longer and with a gradual trade off in volume for intensity. This individual would then start building volume again and in this instance, the ratio of volume to taper cycles might be 4-5 weeks in volume phases while 3-4 weeks are spent in a gradual taper leading up to testing of a lift, or perhaps even a competition. Training with a nagging, but not serious enough to stop, injury or soreness. When traveling to unfamiliar gyms. When dieting for bodybuilding and a period of very low calories must be adhered to for maximum fat loss with a looming deadline. While the goal is typically to maintain intensity to peak, you aren’t necessarily always trying to peak in training. You may need to dump fatigue simply to prevent injury and give your joints time to heal. Through trial and error, a proactive way of deloading before, or just as the joints start to act up, can be great for those whose joints start to play up and ache concurrently (or independently) with the buildup of fatigue. In this deload, 1 set is dropped off AND loads are reduced by 25% for one week. If a one-week deload was enough to give that nagging injury a breath of fresh air, or adequate time to give the old man joints a break, then increasing back to normal loads and volume would be appropriate afterwards. However, if more time was needed, one could either repeat the week, or add in volume in the form of more reps, in essence tapering volume up to normal levels. As was mentioned in Part 1 of this blog, bodybuilders can benefit greatly from deloads as they usually train with much more volume than most lifters. With bodybuilders nothing really changes. We want an overall temporary drop in volume. Once the deload is complete, fatigue will be reduced, and new volume can be added. One very fun way for bodybuilders to deload is to end each block with BFR on all isolation and low impact compounds and eliminate all high impact compounds like the “big 6 movements” (this refers to a horizontal push and pull, a vertical push and pull, a hip hinge, and a squat pattern). Then once the deload is complete, the block can be restarted either right where the previous block left off, or perhaps even a few more reps (volume) can be added. I have to give credit where it’s due. I did not come up with this idea, but like many of us do, someone at the gym suggested it to me. Unsurprisingly, he is a very seasoned bodybuilder in the Iron game with a physique to show for it. I don’t know his age, but I would guess it’s close to mine, mid to late 40’s. In fact, I did not even think to include it until an even more seasoned bodybuilder by the name of Jeff Alberts (you might have heard of him) brought it to my attention again. In any case, this bodybuilder takes a full week of training off during the time change each year. Here on the west coast we change our clocks twice per year. Using the time change as a reminder, he takes a full week off from training, or at least 5 days. When the time changes, it throws your internal clock off and sleep gets disrupted easily, so it’s an opportune time to really take it easy, especially if you are someone who neglects deloads most of the year. As discussed in the “why do we deload” blog, lack of sleep will greatly increase fatigue and training can be an absolute waste or even counterproductive. As you can imagine, he comes back refreshed and ready to go. His aches and pains are healed up and many times, he feels like he actually gains a bit of size in the first month after his deload. Who am I to argue? He’s jacked! This is a question I get asked all the time. 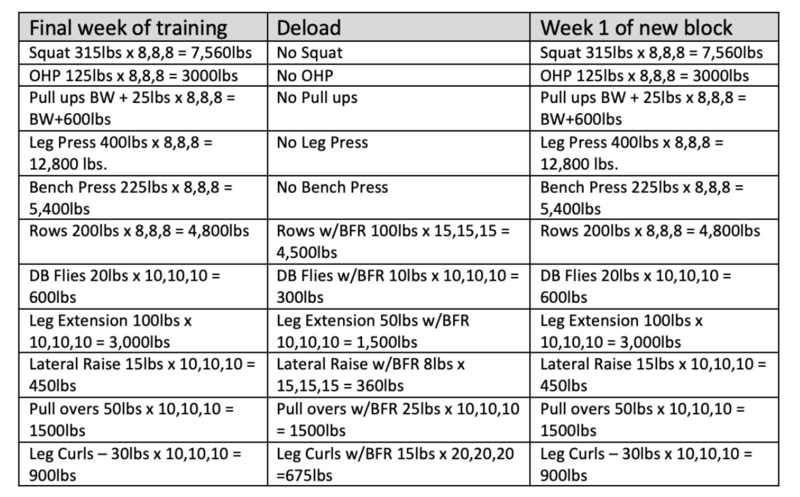 “Coach what should I do for my training while I’m on vacation?” Remember the basic components of a deload: bringing overall volume down while the rest remains the same. Often times when we vacation, we actually do want to train. After all, it’s fun to visit gyms that are out of town and network with those that train there. However, we either don’t have the time to execute the same number of training sessions, or we can’t train at all. My “go to” coaching call is to have my clients search out a good gym and simply do 1 or 2 full body training sessions and have some fun while they are at it. Hit all the body parts, prioritize the compound movements, don’t do a whole ton of reps, and use some good heavy weight. Heavy weight in turn doesn’t allow for many repetitions, which keeps volume down, further serving our deload purposes. Now if there is no time to train, or where you are vacationing does not have the equipment / facilities, simply refer to the “Bi-Annual Total Recovery” deload above and take the opportunity as a week off. You’ve probably figured out by now there is darn near a thousand ways to deload. As long as the intent of dropping volume for a short period of time is met, you can actually mix and match any of the above. The decision of how to do it depends on what condition your body is in, what may or may not be going on in your life, and the context of your prior or upcoming training blocks. 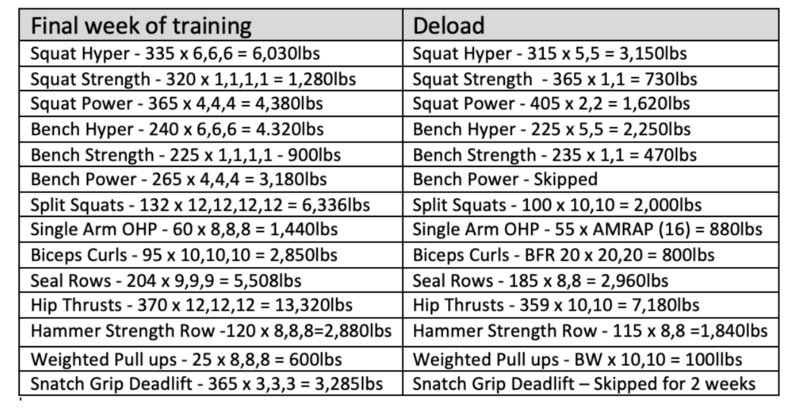 So, with that said, I will leave you with a look at a deload from one of my 2018 Raw Powerlifting Preparatory training blocks. If you look close, there is a little of each of the prior 13 deloads all combined into 1. Enjoy!! How often would you recommend a deload? every 4/5 weeks?